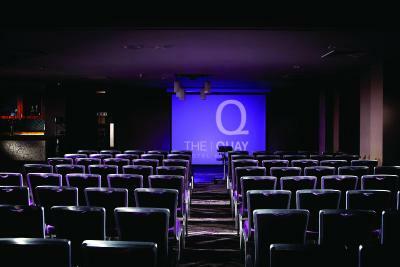 Lock in a great price for The Quay Hotel and Spa – rated 8.8 by recent guests! 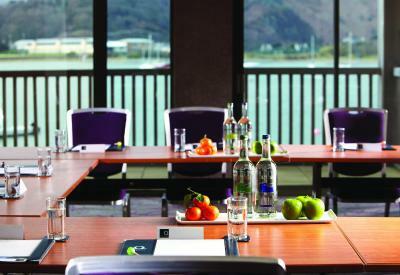 The location of the hotel and the views across the estuary to Conwy were fantastic. Breakfast was very good too - cooked breakfast freshly prepared to order with plenty of choice. Reception greeting wonderful & accommodating. Breakfast staff couldn't do enough for you & everyone with a smile. Lovely spacious room and bathroom. Plenty of parking. Nice bar and restaurant with views over the estuary and an outside seating area. Overnight the room was very quiet even though there was a wedding going on, on both nights. Room was comfortable, bathroom was great lady at reception was excellent. The view was breathtaking. The staff was friendly and accommodating. It is a beautiful facility. 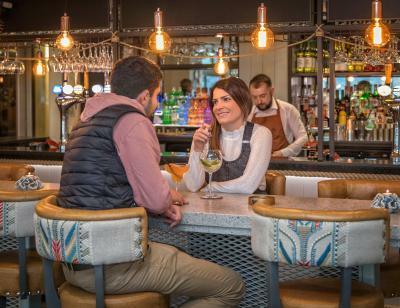 The Quay Hotel and Spa This rating is a reflection of how the property compares to the industry standard when it comes to price, facilities and services available. It's based on a self-evaluation by the property. Use this rating to help choose your stay! 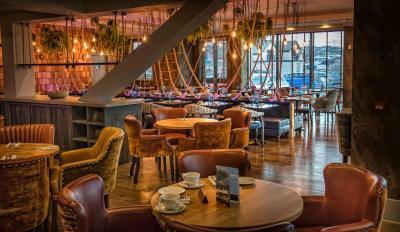 One of our top picks in Conwy.The contemporary Quay Hotel and Spa is located on the breathtaking Deganwy Marina, with views over the Conwy Estuary. The fully nonsmoking hotel has been meticulously designed throughout, and its architecture epitomizes cool sophistication. The large, airy spaces, understated chic and sharp styling combine to create a truly inspirational hotel experience. Wall-to-wall windows with sea views flood the interiors with natural light, and the use of specially quarried Welsh slate makes a thoroughly individual design statement. The rooms incorporate plush beds dressed in crisp Egyptian cotton, luxurious bathrooms and unrivaled in-room facilities. 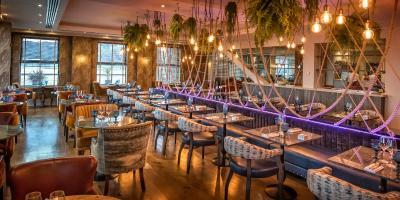 When would you like to stay at The Quay Hotel and Spa? The Classic Rooms offer views over the tranquil Zen court yard. Most have private balconies, terrace areas or a Juliet balcony. All Classic Rooms have a spacious private bathroom with a bath and shower and include luxury Aromatherapy Associates toiletries. Rooms are located on the Ground Floor or can be accessed by a elevator. 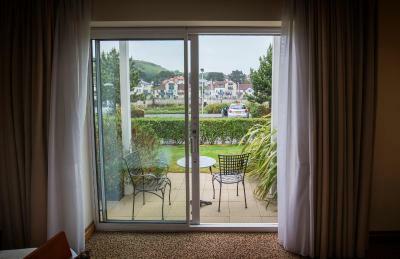 Please note these rooms do not have views of the Conwy Estuary; please book an Executive, Suite or Penthouse to guarantee this view. With views over the tranquil Zen courtyard, this room includes a spacious private bathroom with a bath and a shower. Most rooms have a private balcony or a terrace area. Others have floor-to-ceiling windows with a Juliet balcony. The rooms are accessed via a elevator and 1 room is located on the ground floor with an adapted shower room suitable for guests with mobility issues. The ground floor room does not have a view over the courtyard. 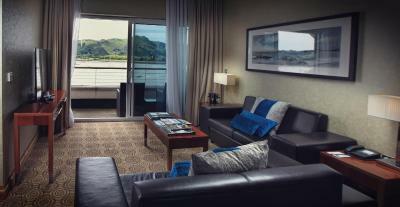 This luxury suite features a spacious lounge area, overlooking Conwy Estuary and Conwy Castle. Located on the ground or first floor, it offers a private terrace or a balcony. Please note that some suites only have access via a staircase, not a elevator. 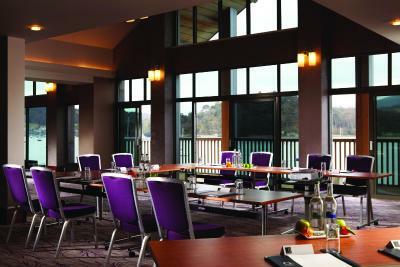 This spacious room overlooks Conwy Estuary and Conwy Castle. Some have a balcony or a terrace. 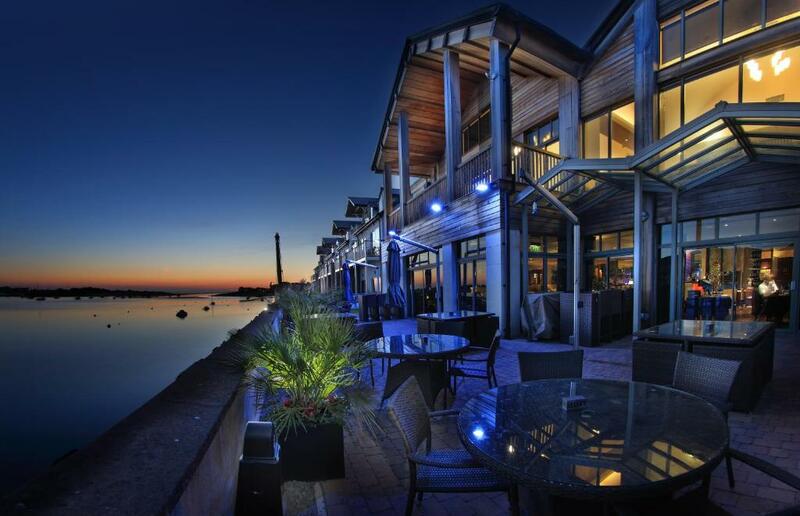 The Classic Marina Rooms are located on the ground floor, adjacent to the private access road overlooking the car park leading to the Deganwy Marina, where the boats are moored. 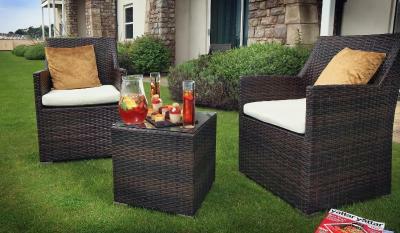 All offer a furnished terrace area with direct access to the marina. All Classic Rooms have a spacious private bathroom with a bath and shower and include luxury Aromatherapy Associates toiletries. Guests should kindly note that only some of the Classic Marina View rooms are dog friendly. Please contact the property for further information. This ground floor room is adjacent to the private access road overlooking the car park leading to the Deganwy Marina, where the boats are moored. All Classic Rooms have access to a furnished terrace area, a radio and a spacious room with attached bathroom with luxurious Aromatherapy Associates toiletries. One of this room type has a wet room with shower, suitable for guests with restricted mobility. To request this, please use the Special Requests section when booking (subject to availability). Please note these rooms do not have views of the Conwy Estuary. Please book an Executive, Suite or Penthouse to guarantee this view. 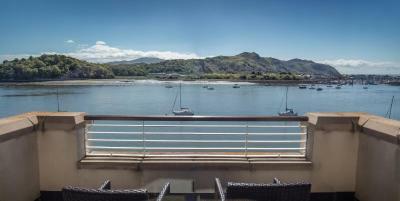 This first floor room has a private balcony adjacent to the private access road, overlooking the car park leading to the Deganwy Marina, where the boats are moored. 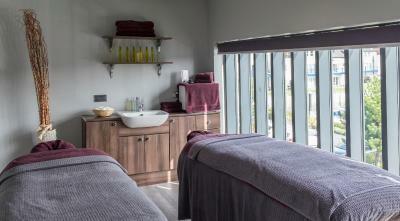 Each room has a spacious room with attached bathroom with luxurious Aromatherapy Associates toiletries. One of this room type has a fully adapted bathroom with shower, suitable for guests with restricted mobility. To request this, please use the Special Requests section when booking (subject to availability). 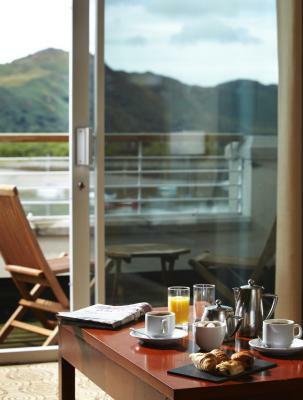 Please note one Superior Double Marina Room has views of theConwy Estuary. 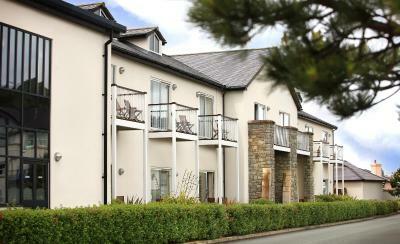 The remaining Superior Rooms do not have views of the Conwy Estuary. Please book an Executive, Suite or Penthouse to guarantee this view. 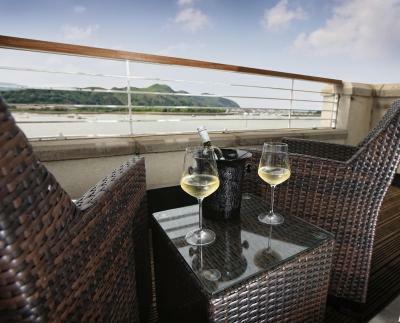 This first floor room has a private balcony adjacent to the private access road, overlooking the car park leading to the Deganwy Marina, where the boats are moored. 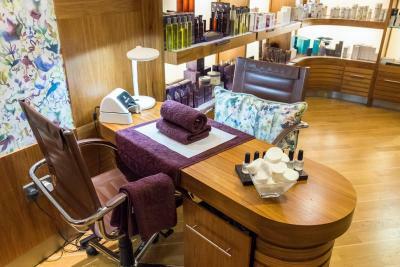 Each room has an private bathroom that includes complimentary Aromatherapy Associates toiletries. Some rooms come with a wetroom, which is suitable for guests with restricted mobility. This room is available on request. Please note you may be allocated this room type. 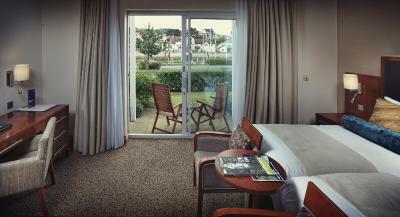 This room has a view of Conwy Estuary and Conwy Castle. The room features a wet room. Please note that this room is suitable for guests with restricted mobility. This penthouse suite features a seating area with a flat-screen TV, coffee machine and a desk. Guests can enjoy views of the sea from the suite's balcony. The private bathrooms contain bathrobes, a hairdryer, free toiletries and a bath or shower. This room features a desk, safety deposit box and ironing facilities. The private bathrooms contain free toiletries, a hairdryer and bathrobes. Guests can enjoy views of the courtyard from this room. 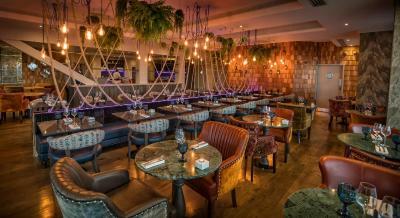 House Rules The Quay Hotel and Spa takes special requests – add in the next step! The Quay Hotel and Spa accepts these cards and reserves the right to temporarily hold an amount prior to arrival. Bookings of 6 rooms or more are considered a group booking and are subject to different terms and conditions. Very old and uncomfortable mattress, we did not sleep well at all. The only thing that I found disappointing were the bar prices, it's a shame, their profit margin must be very high. All the facilities at the hotel were great. Room was not cleaned and not sorted properly some days. It is more of a car park view rather than marine view. Door was left open one day after maids cleaned the room! Hotel didn't provide certain things such as robes unless you specifically ask for it from reception. Landline was disconnected so couldn't order room service. Breakfast was order based rather than buffer so you have to get up VERY early to avoid the queue, unless you pay extra every day for breakfast room delivery. The room was flooded due to water leakage from upstairs during our stay and the staff gave excuses blaming power cutoff. The wall was thin. Considering the amount we paid for a stay here, we were all extremely disappointed with the surly, unfriendly and downright hostile approaches of several of the staff. The waitresses at breakfast were quite possibly busy and harassed but a smile or two, a helpful approach and an indication that you existed would have made breakfast time more enjoyable. To have a waitress come up to us at the end of breakfast and bark at us "what is your room number?" when we had already given it made us all feel that she would have preferred us not to be there. The bar man was similarly hostile and quite rude - there was a power cut (which must have been stressful in itself) however there was no need for his brusque and arrogant manner. Not sure how the Quays train staff but it certainly isn't good enough for a hotel charging this amount. Also furniture in the room was looking a little uncared for and in need of renovation plus there was dust on the bedside table. This is a stunning hotel, the location is everything - views of Conway Castle down the estuary and the open sea in the other direction. The public rooms are beautiful and the outdoor area is stunning. Limited access to lifts on day of departure due to cleaning team . Lovely hotel, great views, yummy breakfast. Definitely recommend this for a romantic break in North Wales. The restaurant staff need a lot of training. It seems like they had plenty of people on but they were completely overwhelmed and couldn’t answer basic questions. They avoided eye contact and ignored customers. Nice hotel with a nice outlook if your on the side of the property looking out over the water.